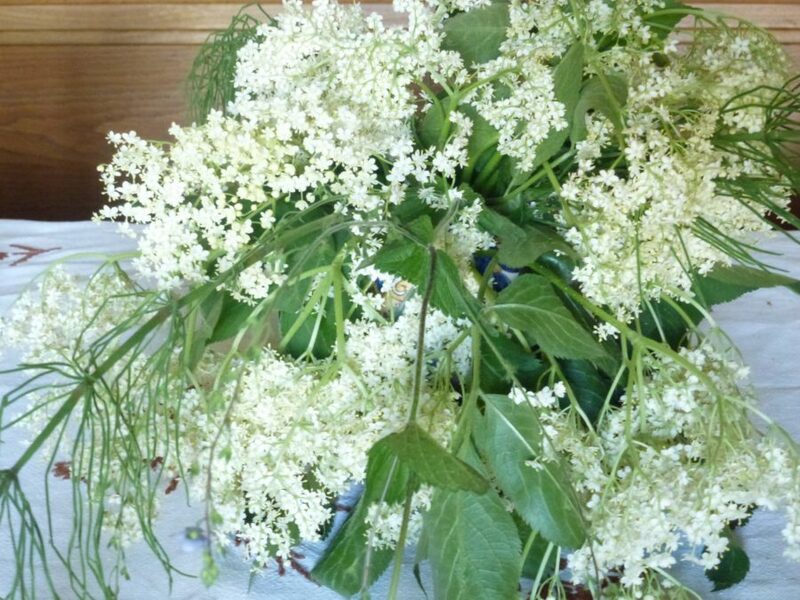 My inspiration for picking today’s Elderberry Bouquet spurred from the royal wedding this weekend of Prince Harry. The new Duchess of Sussex (Meghan Markle) portato un bel bouquet naturale per il suo matrimonio. Il suo profumo era semplice, ma elegante. Si vantava delicatezza al suo culmine con caratteristiche bianchi e flessuose. Had she in fact picked it fresh from her lavish sunken garden? My story is a bit different than Meghan’s though. My inspiration came to me via way of spring and the forest. If you were blind and could not see the white blossoms all around you, then you could smell them. Infatti, they are the back drops of spring. The Sambucus or Elderberry (Hollunder) is a very inspirational bush. Inspiration stemmed during the time of garden apothecary (middle ages and later), when health was indeed very delicate, has held on throughout society for hundreds of years. Death seemed to hang around every corner. One thing was certain then, every “Potager” garden was said to have a Sambucus bush on hand. Soon it became the common belief throughout Europe, that if you didn’t have one in your garden, you were not prepared to get through the ailments of winter. The simple fact was, the elderberry bush was a life-source plant to the herbal world. The blessing was that this plant was not difficult to grow, as it seemed to almost magically appear in the gardens and throughout the country sides of Europe. This is mostly because birds planted these wonderful bushes. They feasted from the berries during the spring, then would poop the seeds. Elderberry soon grew a fine reputation for treating and preventing Infezioni respiratorie. Bronchite, lung infections, as well as keeping the immune system alive and well formed to be the most common treatments. The bush offers two options of goodness, first the sweet, aromatic flowers, followed by the small, dark purple berry clusters that form. conseguentemente, both are equally beneficial in treating health ailments and sickness. I’ve had these blossoms as a fried fritter, in a syrup, or in tea. My intent for today’s pick was to make a lovely, light syrup. 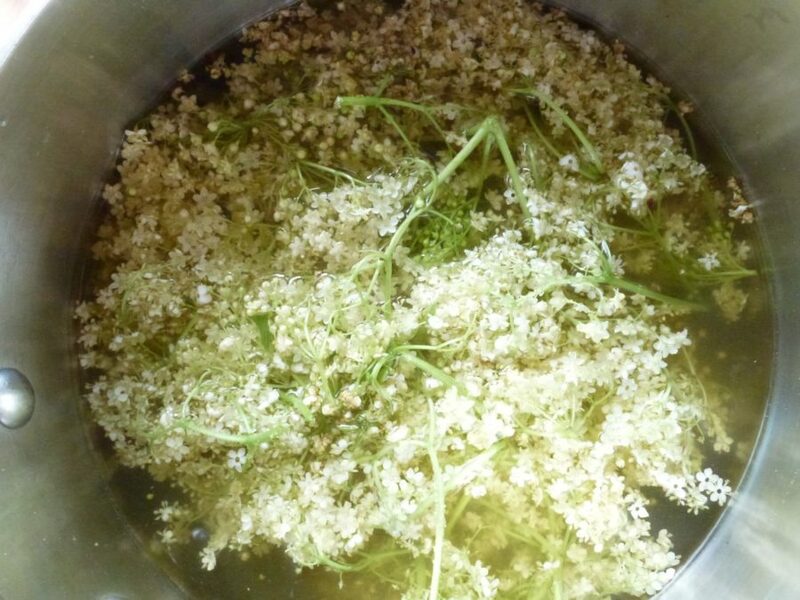 In Europe, we use the elderberry flower as a sweet light syrup. Mostly in water, tè, cereal’s, or on toast. It’s quite simple to make. In breve, cover the flowers with sugar in a pot, aggiungere acqua, let them soak for a few hours, then cook it down on high heat for a good 10 verbale. The result, is a light, golden nectar. 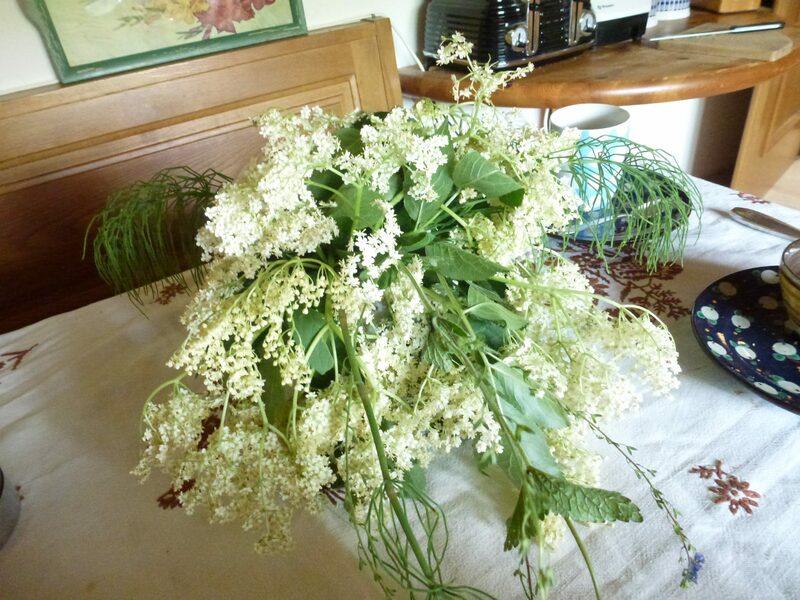 Only pick flowers, erbe aromatiche, etc, in remote locations. Avoid picking where spraying might have occurred, or blown to, and avoid picking on high-traffic areas. Keep your herbs as pure and as close to nature as you can possibly find.